« New Store Offerings! Come Shop Monday! Michael Judd’s book Edible Landscaping with a Permaculture Twist: How to Have Your Yard and Eat it Too was an informative read that we have already utilized in our yard. This book was great! It took a few permaculture principles, and explained each to a depth that made me feel comfortable immediately implementing the principles in our garden. The principles that spoke to us the most were mushroom cultivation, hugelkultur, and herb spirals. We’ve been talking about growing mushrooms for a while now, but we felt a little hesitant because we didn’t think we knew everything we should in order to grow them successfully. This book told me all about mushrooms, and therefore made me comfortable cultivating mushrooms. We had heard of hugelkultur before, but hadn’t researched it extensively. This book explained the strategy in a very easy to undertand manner. I liked hugelkultur because it uses wood: branches, scrap logs, etc. 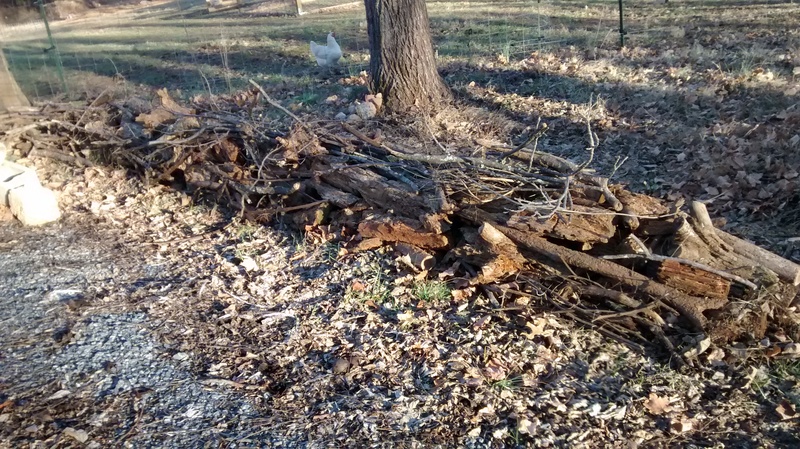 and we have a lot of wood on our property. We harvest our own firewood from our property, but some wood is too small or too rotten to use as firewood. I loved the idea of using that wood for hugelkultur. In fact, we have already begun implementing hugelkultur on our property. It may just look like a line of sticks, but eventually that line will be a nice planting bed! It will hold rainwater, lessening mud in the rainy season and needing less watering in the dry season. It’s far from finished, but hey, at least it’s started! Regarding herb spirals, we had heard about them before, but this book gave us the instructions to make an herb spiral and feel like we knew everything we needed to know. One of the things I loved about this book is that the author included photos of actual examples of the principles he presented. It made the concepts easy to understand. The author is based in Maryland, which I appreciated as we are right next door, so I knew that what he recommended would work in our climate. There are so few gardening books written with expertise in our area! I would highly recommend this book if you are looking at utilizing permaculture principles on your property. It is an easy read that makes permaculture doable.